The Agency was established in 1995 with the support of the US Agency for International Development (USAID). Initially serving as a liaison focused on strengthening communication between city governments and the business community, it soon attracted as members the municipalities, training centers and organizations supporting the economic development of the region. Stara Zagora Regional Economic Development Agency (SZREDA) has worked on a number of programmes and projects, funded by the European Union, USAID, as well as on British, Canadian and Italian bilateral programmes. SZREDA is a member of the Bulgarian Association of Regional Development Agencies and Business Centers (BARDA) and the regional representative of the Bulgarian Small and Medium Enterprises Promotion Agency, the Bulgarian Foreign Investment Agency and the Bulgarian Trade Promotion Agency. SZREDA has a number of partners and clients throughout the Stara Zagora region, including small and medium size enterprises, local governments, state institutions, non-government organizations, and individual citizens. The Agency also partners with a number of national and international organizations, and provides services to foreign companies. 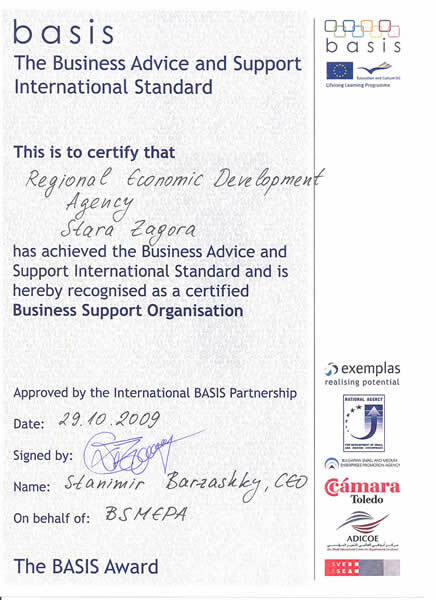 Stara Zagora Regional Economic Development Agency has achieved the BusinessAdvice and Support International Standard. SZREDA has been certified as a Business Support Organisation on the international conference, Setting the Standard for SME Support in Europe. Took place at the Grand Hotel, Sofia on 29 October 2009, this conferencewas attended by specialists and key influencers from all over Europe keen to learn more about the new EU-wide initiative to create consistentstandards for those involved in SME support. Basis is a new standard for those involved in supporting small and medium sized enterprises. For the first time, the different quality models and competencies in SME support have been researched at a pan-European level to identify critical success factors. The release of Basis follows 2 years of international development and piloting work and is a cohesive, practical and easy to use framework formanaging effective SME support. This success is recognition of the long-term efforts of the citygovernment and the Regional Economic Development Agency in creatingfavourable conditions for direct investment in Stara Zagora. 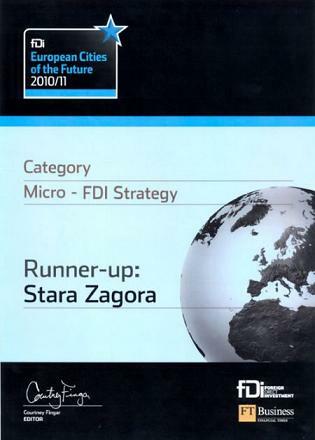 Itconfirms once again what we believe: Stara Zagora is an excellent placeto live, work, visit and invest. It took more than 6 months to the fDi Benchmark Division (anindependent database which benchmarks global locations according to howattractive they are to foreign investors) to compile and evaluate thedata of the participating cities and regions in the European Cities andRegions of the Future 2010/11 competition. The next Europeancompetition will be held in 2 years time.